Map showing the epicentre of a 6.5 quake to hit the Philippines Thursday. 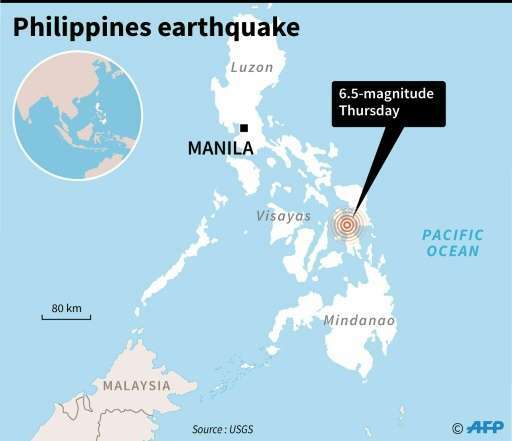 A 6.5-magnitude earthquake rattled the central Philippines Thursday, US seismologists said, with shaking reported although residents in two major cities reported no major damage. The quake hit at a depth of around six kilometres (four miles), on the central island of Leyte, the US Geological Survey said. There was no immediate warning of a tsunami, the Pacific Tsunami Warning Center said. Large parts of Leyte were devastated by super typhoon Haiyan in November 2013. Huge tsunami-like waves smashed the city of Tacloban and nearby areas, leaving 7,350 people dead or missing. A receptionist at Hotel XYZ told AFP the quake was felt in Tacloban, but did not damage buildings there. "It was far away from here, were are okay," the receptionist said. A receptionist at a hotel in another part of the city reported the quake was felt but did not cause damage in the area. "We are safe," he said. In Cebu, the biggest city in the central Philippines, a receptionist at a hotel also said there had been no major damage. But people across the region of mostly farming and fishing communities reported feeling a powerful quake. Marlon Tano, a Leyte farmer and journalist, told AFP it knocked him off his feet at his eggplant farm in Borauen, a town near the quake's epicentre. "It was so strong that I fell," Tano said. "I saw buses and motorcyles stopping on the highway and people getting off them," he added. The Philippines lies on the so-called Ring of Fire, a vast Pacific Ocean region where many quakes and volcanic eruptions occur.